A month ago, The Swamp was back and the Gators were well ahead of the rebuilding schedule after a thrilling upset victory over then No. 5 LSU. Just a week ago, Florida was 6-1, ranked inside the top 10 and had a real chance to win the SEC East at the Cocktail Party in Jacksonville. Down only six and with Georgia backed up deep in its own territory on a third-and-11 early in the fourth quarter, the Gators were a stop and a score from potentially playing their way into the College Football Playoff conversation. Even after the fourth quarter collapse and defeat to Georgia, Florida found itself ranked No. 11 in the first batch of Playoff rankings, controlling their destiny to earn a New Year’s Six bowl invitation. But on Saturday, a glorious autumn day for Homecoming football in Gainesville, the Gators had a chance to bounce back and put what has been a fun season back on the winning track. Instead, Florida was mauled by Missouri for the second consecutive season, a 38-17 loss that all but eliminates Florida from New Year’s Six conversation and leaves the Gators once again a program with far more questions than answers. The questions start at quarterback, where Feleipe Franks followed his abysmal performance against Georgia with an even more mind-boggling display of football Saturday. In just over one half against a Missouri defense that entered the game ranked 123rd nationally in pass defense (worst in SEC) and 126th (worst in the Power 5) in sack rate, Franks was inaccurate, inept at reading simple defenses and wholly ineffective. Before being replaced for Kyle Trask late in the third quarter, Franks was 9-for-22 passing for only 84 yards, an average of just under 4 yards per attempt. 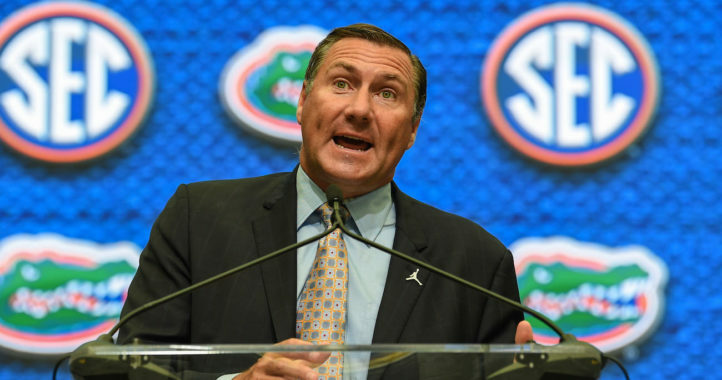 Mullen hinted after the game that the quarterback competition would again be open ahead of Florida’s SEC finale next week against South Carolina. Mullen wouldn’t have put Kyle Trask in to finish the game otherwise, he told the media after game. Florida fans have reason to be skeptical. They have heard the “open competition” lingo before, and it usually ends with another start for Feleipe Franks. That’s fine if Franks gives Florida its best chance to go 9-3, which would be a terrific mark for Florida under a first-year regime that’s coming off a four-win 2017. The problem is deep into this season, it’s becoming more difficult to imagine Franks as the player who gives Florida the best chance to win every Saturday. Barry Odom’s Missouri defense was determined to take away the one thing Franks has done well this season: complete short passes and let his receivers make plays. Missouri brought press coverages and stayed at home on Florida’s swings and screens, daring Franks to complete intermediate and vertical throws down the field. Franks couldn’t, and often, his throws weren’t close. Forget for a moment that Kyle Trask moved the offense better than Franks in limited action. If Trask had been better than Franks this season in practice, he would have played. But with Franks continuing to be Florida’s best option, that means the Gators have a limited ceiling for growth as a team and program under Dan Mullen. As good a play-caller and offensive schemer Mullen is, there’s only so many ways to cover up Franks’s various deficiencies. It’s a familiar and tiring refrain in Gainesville but it’s one that three years into Franks’s career rings true: until Florida finds a more capable player at quarterback, the program’s efforts to chase Georgia and Alabama will be mostly futile. It wasn’t just Franks on Saturday. The Gators defense, once the elite heartbeat of this program, was terrible Saturday and has been woefully inadequate over the past two Saturdays. In a five-quarter span covering Florida’s second half against Georgia and the first three quarters against Missouri, Florida’s defense managed one sterling goal-line stand but otherwise surrendered over 600 yards of offense and 58 points. Those numbers are very bad, regardless of who plays quarterback, and Florida won’t be elite again until the Gators defense is the sleek, feared unit of reputation again. Epic goal-line stands are nice for end-of-year highlight videos, but three-and-outs are better. Florida didn’t get enough Saturday. The Gators were especially horrid on third down, allowing Mizzou to finish 11 of 18 on third downs. Florida’s secondary should have been better Saturday given the return of midseason consensus All-American Brad Stewart and All-SEC caliber corner C.J. Henderson. Henderson played well, but Stewart blew a coverage on a second-half touchdown and was part of a back end of the Gators secondary victimized by Missouri quarterback Drew Lock all afternoon. Lock entered the game with only one touchdown pass against five interceptions in four SEC games. He left with his first win over a ranked opponent and likely the most efficient SEC performances of his career, one that saw him connect on 24 of 32 passes for 250 yards and three touchdowns. Florida’s vaunted pass rush was nowhere to be found — the Gators recorded zero sacks and have only two in the prior three games. Florida also did not force a turnover — and after an opportunistic start to the year that saw Florida force 18 turnovers in six games, Florida has forced just one in their past three contests. All told, Florida’s failings at quarterback and on defense allowed them to be run out of their home building by a Missouri team that, while statistically better than their 4-4 record, shouldn’t be winning by three scores in The Swamp. Over the last two seasons, a Missouri team that has struggled to win league games has outscored Florida 80-33. This Mizzou team isn’t a great matchup for Florida, as we wrote last Monday, but as good a job as Missouri has done to prepare, that type of disparity should embarrass the Gators. 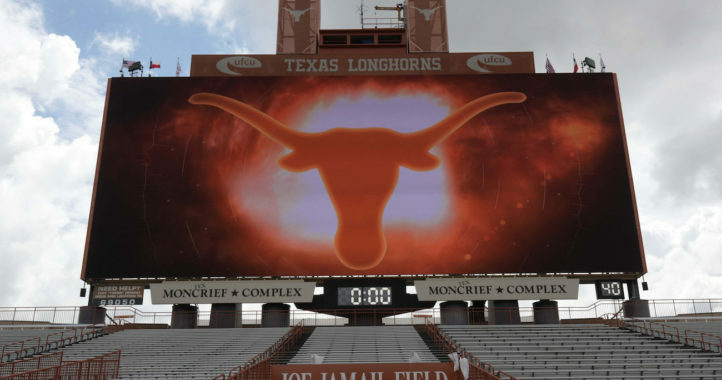 It certainly embarrassed their fans, many of whom filed for the exits when the team fell behind 35-10 in the third quarter. The Gators talked a great deal this summer about Mizzou, with Cece Jefferson even mocking Missouri’s home field advantage at SEC Media Days. The Gators also talked this week about responding to the Georgia loss the right way and finishing the year strong for the seniors and the new coaching staff. Florida’s players certainly talk a big game, but talk is cheap when a program hasn’t fully embraced the process of winning. 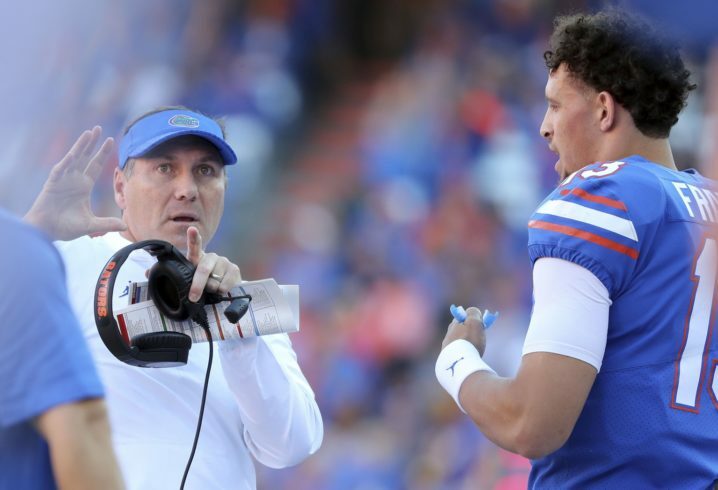 Florida will have another chance to get back to playing to what Dan Mullen calls “the Gator standard” in a week, one of three final chances in this regular season. It is, as Nick De La Torre wrote at Gator Country, “gut check time” in Gainesville. Florida will need to do more than talk about playing hard and winning or they’ll squander those chances, and a once-fast-moving Mullen rebuild will find itself suddenly stuck in neutral, remaining there until Florida commits to consistency in all phases of its operation. Mullens is a bad coach against bad teams. it’s not a bad matchup for a team switching QB’s after mid season, Gators passing efficiency was bad enough to not expose the MU secondary, elsewhere the Tigers have good enough talent. Odom didn’t out coach anyone, the team simply went out and played better. Missouri has a terrible pass rush and a bad intermediate and vertical pass defense. It has a great run defense. Florida has a bad run defense and a bad intermediate and vertical pass defensse. It is a good power running team but only when it’s quarterback makes some plays. That’s why it was a bad matchup for the Gators. Missouri does not have a good pass rush since we have no Def ends going pro as we have had in the past, We have a very good LB in Cale Garrett. Florida was a good matchup for Mo. Mizzou finally put two good halves together. I am scratching my head as to why they were ranked 11 in polls and how they ever managed to beat LSU. 2. Mullen hit his head on his coaching ceiling, demonstrating that he tends to coach down to the level of weaker opponents. Neil, It’s not so easy to know how the player on one side of the ball is going to matchup against the player on the other side of the ball. Even harder to know how teams and parts of teams are going to match up. Missouri is a lot better than how the refs interpreted their 2018 SEC games. Only Washington State and Missouri scored 40+ points on Wyoming this year. Missouri lead almost the whole game against a Purdue that smashed Ohio State. Memphis lost to UCF by 1 point,…next week Missouri scored 65 before the 3rd Quarter. The whole SEC East is good this year. This makes the losing team and fans scratch their heads. A lot of Missouri results this year were skewed by their own mistakes. When fans that don’t know this see Missouri not make a lot of game changing mistakes, like at Florida, it’s an invisible difference. None of this makes Florida’s roster bad, or Mullen bad. Florida was ranked 11th for good reasons, but don’t count on South Carolina to make these reasons obvious either. No doubt. The SEC East is clearly better than the West this year, save the NFL team that won the West. This article didn’t mean to denigrate Mizzou- I picked them to win the game- but I think Florida’s effort at home against a team that beat them by 29 the year before was miserable. As Mizzou learned against South Carolina, if you want to collect critical wins– you can’t assume anything. You have to go out and execute. Credit Missouri for doing that Saturday. Yeah but that goal line stand against Georgia was EPIC! I think UF enjoyed it more than any old win. You can’t be a Champion of Life without those moral victories. And so begins the annual losing streak for the Gators. Normally there’s some sort of reason why we suddenly get so bad, like losing the entire starting lineup to injuries or not having a coach, but not this year. How does a team go from beating LSU one week to losing to an unranked team another week? Nothing’s changed in that time! Clearly the talent exists but just isn’t being used, for reasons that are beyond me. People who have not watched Missouri and only see their record do not realize how talented they are physically. I thought going in to the season they had a chance to win the East and certainly would contend. But they got in their own way at South Carolina, played scared against Georgia, and gave the game away against Kentucky. Their potential and ceiling is very high. If they would go out and play like without fear, they would be tough to beat by anyone. The article says Mullen knows what it takes to be a champion. How does he know. By observing Urban Meyer? He hasn’t won anything. He coached st Mississippi State where they have him a free pass because most of the time he was the under Dog. It is going to be different at Florida. Winning 8 or 9 games is not going to be good enough down the road. It will take a least 3 years for Mullen to get Florida to the point where they can challenge every week. UGA vs UA in SECCG=Road kill. If Florida had a decent qb it would have been a much closer game.